The all-new City Express is efficient not just in form but also in function. With 24 mpg city fuel economy, it can deliver the value you need to help increase your overall profitability. It also provides 26 mpg highway and 25 mpg combined, as its distinctive size provides better fuel efficiency than a traditional cargo van or large pickup truck. The responsive Continuously Variable Transmission (CVT) paired with the 2.0L 16-valve four-cylinder gasoline engine has 131 hp and 139 lb-ft of torque. With 122.7 cu. 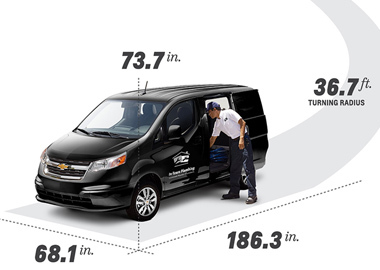 ft. of cargo volume, the 2015 City Express is the small cargo van that suits a variety of businesses. Its unique structure and 48"-long load width between wheel housing can easily accommodate a standard pallet, PVC piping, a 6' stepladder, and even a pre-hung interior door. The 40/60 split rear doors can be opened up to 180 degrees for easy loading and unloading, even if you’re parked on crowded streets. While you maneuver through tight bends and turns, the six floor-mounted D-rings can be used to keep your cargo safe and secure. The City Express is designed to give you maximum utility and efficiency to help you perform a variety of tasks. The exterior dimensions and impressive 36.7' turning radius are crafted to make garage/structure parking convenient and allow youb to easily steer through challenging city environments. The City Express also features a stylish front end with unique headlamps, making it the perfect backdrop for your brand. Take your work anywhere you go with the City Express’ standard mobile office center console. It features a passenger seatback that folds forward to create a flat work space so you can keep your business running, wherever you are. 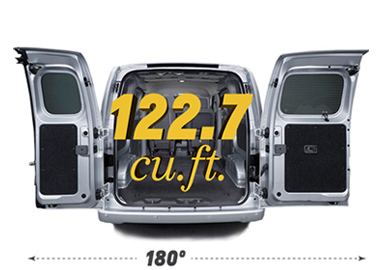 With a total of 13 different storage spaces — including laptop/hanging file folder storage, a stationery tray, dual cupholders, large side door pockets, and two 12-volt outlets available on the LT trim — the City Express small cargo van helps you check things off on your list, even on the go. The standard console with Driver Information Center includes fuel range, average speed, oil life, tire pressure monitor, fuel used, ice warning, engine hours, average fuel economy, tachometer, outside temperature display, and maintenance reminders. Audio features AM/FM stereo with CD player, auxiliary input jack, and two front-door-mounted speakers. The available Technology Package on the LT trim includes a touch-screen display, navigation, SiriusXM Satellite Radio with 3 months of trial service, Bluetooth®† wireless technology (optional) with steering-wheel-mounted audio controls, a USB port, a Rear Vision Camera and Rear Park Assist. The City Express comes standard with six air bags, ABS, traction control, standard electronic stability control, and a Tire Pressure Monitoring System. A Rear Vision Camera is also available with the Technology Package on the LT trim. The City Express also brings additional value to the table with its exclusive Chevrolet Complete Care program, a comprehensive plan that goes above and beyond to ensure that your City Express is running in peak condition. Backed by 2 years or 24,000 miles of included scheduled maintenance, limited warranty coverage that features powertrain, bumper-to-bumper, and rust-through protection, plus 5 years or 100,000 miles† of roadside assistance with courtesy transportation, you can be confident that you’re getting the most out of your City Express.